SEOUL, Korea (Jan. 8, 2018) – In the Women’s -49kg division, 2017 was the year for Panipak Wongpattanakit. Though the Thai only managed a bronze at the Olympics in Rio in 2016, in 2017 she took silver at the Worlds in Muju, then captured three out of a maximum of four golds – in Moscow, London and Abidjan –in the Grand Prix series. Tall and super-flexible, she attacks from radical and unexpected angles, often kicking to the back of the opponent’s head, but is equally effective with her body attacks. Given the multiple threats she represents, it is difficult to say that anyone in the category is a realistic rival. 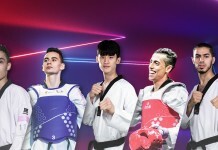 However, three Korean athletes who will be competing in the third edition of the super-elite World Taekwondo Grand Slam series in Wuxi, eastern China will be gunning for her head: So-hui Kim, Jae-young Sim and Min-ah Ha. Since Wongpattanakit lost to master tactician Kim – the eventual gold medalist – in Rio in 2016, she has upgraded her game under the keen eye of her coach, Yong-sok “Tiger” Choi. Wongpattankit’s right-foot body kick and rear-leg head attack are now world-class, and although the three Koreans are well aware of this arsenal and will have analyzed it, whether they can counter it is open to question. None of the three Korean girls can match the Thai’s scorching scorpion kick to the head. In last year’s Grand Prix series, Wongpattanakit used not only her right-foot attack, but added a left-foot body attack and a punch to her collection of weapons, leading to high scores in almost all her matches. Most players lost to her with embarrassingly wide gaps, in the 20-point range. These point chasms are a telling comment on the Thai’s high skill. If she is on game form and in top physical condition, she looks set to storm through to the finals of not only the Grand Slam, but also the other major competitions of 2018. None of the three Korean fighters managed to beat Wongpattanakit in the 2017 season, so will all be looking for revenge in 2018. Olympic Champ Kim has excellent endurance and a very tricky defensive fighting style. A master tactician, she has fast footwork and both head and body attacks, topped off with a nice spinning heel kick. However, she is half a head shorter than the Thai girl, which makes her vulnerable on the high line. In Wuxi, Sim is on the opposite side of the match tree to Wongpattankit and Kim, so has a good chance of fighting all the way through to the finals. Her nickname is the “Ice Princess,” as she is such a cool-headed player. She can both defend and attack with the front foot, attack with an ax kick and also possesses a dangerous (and high-scoring) spinning back kick. Sim only lost to the Thai in the Grand Prix Final in Abidjan on golden point, indicating she may have the best chance among the three Koreans of beating Wongpattanakit. The third of the three Korean musketeers in the category is Ha. At the 2015 Worlds in Chelyabinsk she astonished taekwondo pundits by defeating double Olympic gold medalist Jingyu “Superkicker” Wu of China. Ha’s big advantage is her leg control: She can machine-gun kick from body to head and back down again. In the Moscow Grand Prix, she suffered a huge point loss against Wongpattankit, but if she keeps her head and focuses on her defense, she is in with a chance. Then there is Tijana Bogdanovic from Serbia who won silver after being very narrowly defeated by Kim in Rio in 2016. At the Worlds in Muju in June she pressured Wongpattanakit, and though she has had a disappointing season in 2017, she has superb backing – in the person of 2017’s Coach of the Year Dragan Jovic – and may recover her Rio form. Vanya Stankovic is the second up-and-coming young threat from Jovic’s stable; she won her category at the Worlds in Muju. The dark horse is Team GB’s Charlie Maddox. After winning the Grand Prix Final in Baku, Azerbaijan in 2016, she has been out of competition for reasons unknown, but is certainly a contender for what looks like her comeback fight in Wuxi. Nothing is certain in sport, so who banks the USD70,000 first-place prize money in Wuxi is open to question. But on past form, the Thai fighter looks like the most serious contender.